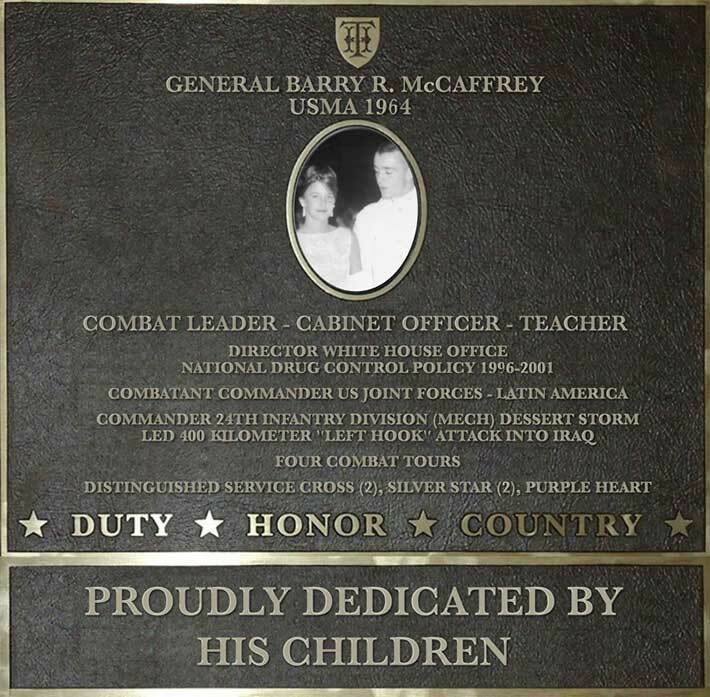 General Barry McCaffrey is a decorated war hero, a four star general and an appointed Cabinet member who has continued a lifetime of service nation for nearly half a century. When he retired from active duty he was the youngest and most highly decorated four star general on active duty. Barry McCaffrey was born November 17, 1942 and attended Philips Academy in Andover, Massachusetts. He entered West Point in 1960 and graduated in 1964 as the bugle was sounding for the War in Vietnam. He chose the Infantry Branch and the prestigious 82nd Airborne and graduated from Airborne and Ranger Schools before joining the 82nd. Shortly after arriving at Ft. Bragg he deployed to the American intervention in the Dominican Republic as a platoon leader. He then deployed in an advisory role to Vietnam advising the Vietnamese 2nd Parachute Infantry Battalion from 1966-1967 and again to Vietnam as an Infantry Company Commander with the 1st Cavalry Division in 1969. During his two tours in Vietnam he was very highly decorated for multiple acts of courage. He received the two Distinguished Service Crosses, two Silver Stars, three Purple Hearts and the Combat Infantryman Badge. His first DSC was awarded for his actions as a First Lieutenant in Vietnam in January 1967 when he was wounded twice in 12-hour battle, the senior American advisor was killed, he took command and courageously led a South Vietnamese unit that was besieged by a larger force. His second DSC was awarded for actions in August 1969 when as a company commander on a reconnaissance in force mission his unit came under fire from an entrenched bunker complex. With one of his squad’s pinned down he single-handedly led an assault on the bunker destroying the machine gun emplacement. Although wounded in the assault he continued to lead until the bunker complex had been eliminated and all his wounded had been evacuated. He received two Silver Stars, one for attacking two Viet Cong and killing them with his pistol during a reconnaissance in force mission in January 1969 and another for attacking and neutralizing an enemy bunker with a hand grenade in June 1969. He returned to the United States a war hero in an unpopular war. After Vietnam Barry graduated with a masters degree from American University and then returned to West Point to serve as a professor in the Department of Social Sciences. The late ‘70s and ‘80s were peaceful times for the US military and Barry, a highly decorated combat leader from Vietnam, rose quickly up the ranks. He led infantry battalion, brigade, and division. In 1990 Saddam Hussein invaded Kuwait and threatened to invade Saudi Arabia and President Bush mobilized the US military to defend Saudi Arabia and liberate Kuwait. As the Commanding General of the 24th Infantry Division he led the 370 kilometer “left hook” enveloping the Iraqi Army and crushing the Republican Guard in Iraq in less than 100 hours. His last command was as the Commander of Southern Command (USSOUTHCOM) and retired after 32 years of service as a four star general. Another threat to US National Security had developed as the drug war continued to profligate. Upon retirement, General McCaffrey was appointed as a member of President Clinton’s cabinet as the Director of White House Office of National Drug Policy from 1996-2001. General McCaffrey served as the Bradley Distinguished Professor of International Studies from 2001-2005 and then as the adjunct professor of International Studies at West Point from 2005-2010. He is the President of his own consulting firm and serves as a national security and terrorism expert for NBC News. General McCaffrey is one of the most highly decorated and respected four star generals in American history. His public appearances in thousands of television shows, articles and publications have helped shape our national security direction.